We sell the modern version of the Bovis scale as developed by Blanche Merz from the original by the engineer Simoneton, and the French physicist Bovis. The intensity of the rays or vibrations, of a place, plant or object can be measured using a dowsing pendulum. The Bovis scale utilises the knowledge of electromagnetic wavelengths and specifically the wavelength of red light which is in the region of 6,500 Ångström units. The wavelength of one Ångström is one ten-millionth of a millimetre. However, since the biometer measures subtle energy and not wavelength, the units of measurement were named after Bovis. These are the so called units of vibrational quality or intensity of radiation of whatever is being measured, in Bovis units. An average value for a healthy abode and for a healthy person is 6,500 Bovis units. Values below 6,500 Bovis units indicate a qualitative energetic deficiency. Values above 6,500 Bovis units indicate a higher quality. The biometer is very simple to use. One method used to measure the quality of the rays in a place or object, is to make contact mentally, and then, formulating questions to the Bovis unit. With the pendulum swinging lengthwise along the base line, it is progressively moved along the scale until the swing alters to cross the line. The point at which the pendulum swings at right angles to the scale is the point to be read. If no response is seen by the time the pendulum reaches the end of the scale at 10,000 Bovis units, then return to the start, and count 11,000, 12,000, 13,000, 14,000 etc. and extrapolate to higher figures as required. For more accuracy and for extrapolation, the additional small scale can be used to suit the type of measurement. For example it can help to narrow down a reading to a more precise figure as well as being used as a multiplier. NOTE: The Bovis scale is a measure in Bovis units and not a measure of Ångström units. The only connection to Ångström units is the “base” point of 6,500 Ångström which corresponds to an average healthy value. This point corresponds to the wavelength of red light. That is the only point on the scale remotely related to Ångström units. In other words, using the Bovis scale and a pendulum, a reading of 1,000, 10,000, 18,000 or whatever – does not correspond to units of wavelength in Ångström. It should also be noted that the Bovis scale is not at right angles or at any angle to the electromagnetic spectrum. 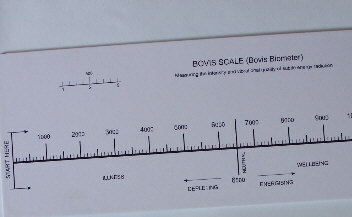 Our Bovis scale has been radiesthetically tuned to the Bovis unit in order to give sympathetic results with the original scale as produced by Blanche Merz. The latest model is made of a lightweight acrylic board and is good for using outdoors also. Suitable pendulums are also available – a neutral pointed one is recommended. Translated by Michele Carter Burdet. Published by The C. W. Daniel Company Limited. This is a book about the influence of what is often called “earth energies” on the human, animal and plant life at any location. In particular it focuses on patterns of lines dowsed by the author at many sacred sites, shrines and standing stones worldwide. I read the book with great pleasure, occasioned as much by its style as its content. For the book is very French, even in translation. The occult and paranormal traditions of Britain and France are curiously different: in a French occult bookshop you find another world, a whole different approach based more on names like Papus and Fulcanelli than on Crowley, Grant and Fortune. The effect is both fascinating and repellent: french occultism seems comparatively pompous and pseudo-scientific by our standards – I wonder if our stuff seems to them like wishy-washy psychologising? Silence is a ceremony in monastic rules; it is always a launching pad for a new surge. According to tradition there was a Silence before the Creation. The energy contained in the silence of dawn, when the heavenly vault re-emerges still empty of colours, is rich in vital potential, in dynamic recharging. Reading this I am first charmed by the sensuous Gallic phrasing, then my soul rebels: “Silence of dawn?? Rubbish! that`s when the birds make the biggest racket”. The very next paragraph meets this objection and disarms me. From the moment of first light, when change occurs progressively, birds set up a great chattering and melodious flights of song. He who observes carefully will note that, five minutes before the sun appears, our feathered friends become silent again. It is a solemn moment when energy seems to be condensed to a maximum, and when one concentrates, one does not chatter. Wow! Is that true? I can`t wait to get up before dawn with my stop watch and see for myself! That is typical of this book and the pleasure of reading it: lusciously worded statements with the sort of dogmatism that irritates in the most positive sense – because it inspires one to go out and put its ideas to the test. The book describes a number of visual clues – based on shapes of trees, signs of damp moss – which anyone can look for, together with three types of measurements. The first is site radioactivity measured with a Geiger counter: I don`t have one so cannot comment on the readings given. The second is the “Hartmann Network”: a regular rectangular grid which covers the Earth`s surface and which is divined with a copper wire dowsing instrument called a “lobe wand”. The third is a measure of site intensity using a pendulum plus a simple scale called the “Bovis Biometer”. Neither the lobe wand nor the biometer are described properly in the book, but they are available here with instructions from a wondrous source of radionic and dowsing gadgets called Emerald Innovations of Gloucester. (I gather that they will also be organising another UK seminar with Blanche Merz in 1995). So I tried both. In my house I immediately detected the Hartmann lines, although my network was rather more widely spaced than the 2m x 2m described in the book. Finding a crossing point at throat level where I was sleeping in my bedroom – and reading that these points are to be avoided for prolonged sitting or sleeping – I moved my bed to a free zone. Anticipating some subtle placebo-plus benefits over the next few weeks, I was surprised to wake the next morning with a clear positive feeling that I had not enjoyed since moving to my present house. A tiresome neck problem that nagged for those years cleared up within the week. I was impressed. 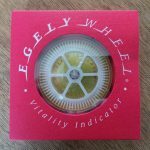 The biometer I tried out in a workshop with the author and we got all sorts of interesting intensity readings for different foods, crystals, locations around Glastonbury Abbey, and chakras on our bodies. I have since used it for choosing a diet, and the result was positive, but I can hardly claim to have tested the biometer at all strictly or conclusively. In both cases the real value to me lay not in any pseudo-scientific experimentation, so much as the fact that both instruments provided a new way to explore my locality. It is too easy to separate out “earth energies” as something which happens “out there” at sacred sites – draining even more magic from our everyday existence and storing it up in other people`s holy places. Working with this book helped me to communicate with my own little patch and rediscover its own genius loci. The book served as a doorway which invites magic back into the everyday environment, it inspires one to locate and sanctify one`s own sacred sites – and that can`t be bad. The book is also a wonderful contrast to Tom Graves` superb “Needles of Stone” – putting the two together epitomises the difference in our cultures. Tom begins from total subjectivity – the pendulum is just a sensitive indicator which the individual can use to create one`s own language of communication with the unconscious. From there, in simple, clear language he invites one to explore and see how much objective information can be divined through this channel. Blanche, on the other hand, begins with what looks like precise objective measurements, quoting figures from instruments (but never giving quite enough information as to the system of measurement and relevant parameters of time, weather conditions etc) and inviting us in rich metaphoric language to reach quite subjective conclusions. A large part of her book describes her experiments at sacred sites around the world, and is as fascinating as any travelogue. Tom Graves would say, quite rightly, that you don`t need a special lobe wand or Bovis biometer: any dowsing instrument could be interrogated to get these measurements once one had grasped the principle behind them. On the other hand, there is nothing quite like a new gadget or a fresh approach to liven up the quest. Reading Blanche Merz` book on the familiar topic of earth energies is like discovering a gem of a French restaurant in a provincial British suburb – it stimulates the taste buds and invites one to explore the menu much further.